With 25GB of free online storage, Windows Live SkyDrive is one of the most powerful online file hosting services available today. A recently released app which goes by the name of SkyAmp lets you utilize all that free space to stream music uploaded on SkyDrive on your Android smartphone. 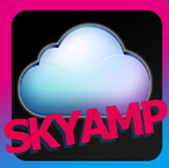 Developed by Sky Droid, SkyAmp is an app which allows users to stream as well as download their music on Android smartphones from the cloud. The cloud, in question, is your 25GB of free space on Windows Live SkyDrive. Once the app is installed (link embedded is embedded at the end), users are asked to login with their Windows Live account. Logging in takes you to the root of your SkyDrive. You may then navigate to the folder where you’ve uploaded your music, tap on the songs you want to listen to and, finally, tap on the icon at the bottom right which adds the songs to the playlist for streaming. Once added, you may listen to the songs from Media Player. 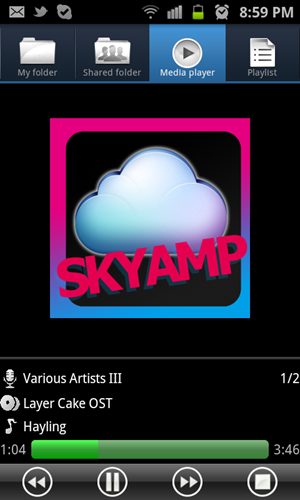 SkyAmp is a cloud-based MP3 player for Android that allows you to stream and download audio from your Windows Live SkyDrive. Just upload your favorite tracks to your Windows Live SkyDrive from your PC and stream them on your device anytime and anywhere. The app allows access to registered Windows Live users only. Get a SkyDrive ID before you start using SkyAmp. We’ve tested the app on our Samsung Galaxy S II and can say that, while it does work as advertised, the experience isn’t as smooth as we’d like. Our biggest beef with it is how SkyAmp only streams .mp3 files, meaning users who have their library full of .flac or.m4a/.aac files simply can’t use this app. Hopefully, support for more file types will be made available soon. There are alternative music streaming services available on Android such as Google’s own Music Beta and Amazon’s Cloud Drive. They don’t use SkyDrive to store your files but work on the same principle. SkyDrive is available in both Lite and Paid versions. The lite version limits users to streaming only three songs at a time, whereas the Paid version, of course, lifts this limitation.